Hangman is a word guessing game. For every guessed letter, which is not in the word, a line is added to a stick figure hangman. Comisat Games Collection 2006-10-10 Snake, Hangman,, Tetris, Board game. Snake, Hangman,, Tetris, Board game. Qt, SDL, and the Gambas Runtime Environment. comisat Games Collection is a free game. This means that the source code is available to be studied, modified, and distributed. Most projects look for help with testing, documentation, graphics, etc., as well. 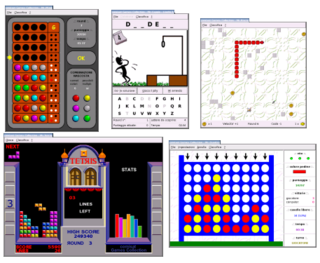 comisat Games Collection is a collection of free software games written in Gambas. It is one of the first notable Gambas games, with exceptions being code examples such as recreations of Snake, Robotfindskitten, and other small efforts. The game is available in English and Italian. Pendumito is a free game. This means that the source code is available to be studied, modified, and distributed. Most projects look for help with testing, documentation, graphics, etc., as well. Pendumito (Esperanto for "a hung person") is a version of the WebHangman modified by Klivo to support Esperanto. Someone criticized the game and its inclusion in the "lernu!" website, because it depicts death/murder. 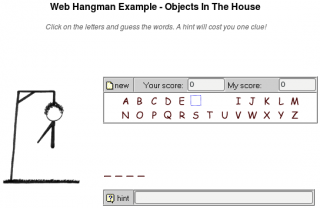 WebHangman is a free game. This means that the source code is available to be studied, modified, and distributed. Most projects look for help with testing, documentation, graphics, etc., as well. There is a version in Esperanto called Pendumito. This page was last edited on 28 July 2018, at 09:04.